Newport Harbor High School Drama Department is presenting the “God Help Us” play staring Ed Asner. Running time for the show is approximately 80 minutes. Go to godhelpus.net for more info on the show. This is a fundraiser for NHHS Drama with 40% of the box office and all concessions going to their performing arts program. Maybe only the Lord can bring us together in this hilarious and insightful entertainment, where the debate gets hot and the passion gets hotter. 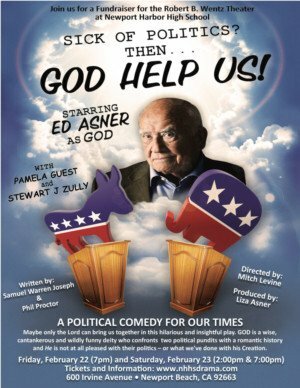 GOD – legendary actor, Ed Asner – is a wise, cantankerous and wildly funny deity who confronts two political pundits with a romantic history: Lawrence (a liberal lad) and Leslie (a conservative gal). He is not at all pleased with our politics or what we’ve done to his Creation. GOD HELP US! speaks to audiences of all political persuasions with one essential argument: that we have to listen to each other so that we can all live – and laugh – together. Ed Asner (Actor/Star): Versatile, committed, eloquent and talented are all adjectives that describe actor/activist and 8-Time Emmy Award-winning actor ED ASNER. He starred as Carl Fredricksen in Pixar’s 2009 box-office- hit Oscar winning Best Picture UP! and as Santa in the Will Ferrell hit, ELF. Mr. Asner was the recipient of his eighth Emmy Award at The CSA Awards for his guest appearance in the Canadian dramatic series Forgive Me. Mr. Asner is best known for his comedic and dramatic talent as the gruff but soft-hearted journalist Lou Grant, the role he originated on the landmark TV newsroom comedy, The Mary Tyler Moore Show, and continued in the newspaper-biz drama Lou Grant, which earned him five Emmys and three Golden Globe Awards. Mr. Asner received two more Emmy and Golden Globe Awards for the mini-series Rich Man, Poor Man and Roots.